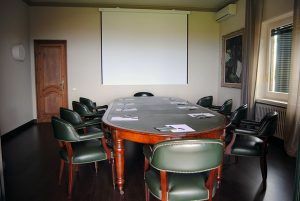 Sant Vicenç Golf Club is the ideal location for any type of event, work meetings, presentations or conferences less than 35 minutes from Barcelona and just 45 minutes from Gerona. Our Club House has 2 rooms for interviews, training workshops, meetings, business deal closings with clients, etc. with capacity for up to 20 attendees as well as exclusive and unique areas to hold events, photo sessions, photo calls, presentations, etc., all with fantastic and wonderful seafront views. Our rooms feature natural light and offer views of the sea from large private terraces with direct and exclusive access. The rooms also have independent lighting and climate control as well as Internet access. Available by the hour or by the day.